There was a stage of my life when I was very into taupe coloured eyeshadows. Taupe is a grey-brown colour that can be very flattering or very unflattering, depending on its tone. After much experimentation, I worked out that taupe colours with red tones made me look like a tired panda, while cooler tones with silver mixed in were much more flattering on my skin. Such a shade however, is hard to find. A first look at the Dior Fall 2007 eyeshadow duos did nothing for my excitement level. I’m averse to matte eyeshadows because there are so many mistakes one can make with matte colours while shimmer colours are more forgiving. One of the duos was Silver Look – a flat looking grey-brown on one side and a shimmery silver on the other. 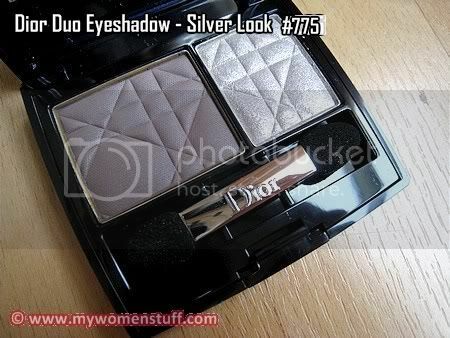 I had the Silver Look eyeshadow duo from Dior, but it did not look exciting enough to wear. The colour just looked too blah to me. But one day, feeling tired of my usual eyeshadow colours, I took Silver Look out of its box and tried it on. As I have said, matte colours are scary and these swatches will explain why.See the brown on the lower left? That’s just swiped once on the shadow and then on my hand. Matte eyeshadow shades tend to be very pigmented. Once they go on, and if you don’t blend them in properly, you get a mess. However, Silver Look is quite forgiving because it comes with a shimmery silver colour. Swiped by itself, the brown is a blah flat matte brown. Overlaid with the silver shimmer, it immediately took on a gorgeous shimmery taupe tone that I couldn’t take my eyes away from. The shimmery silver brought out the grey tones in the brown and I have since worked out that grey is my no-brainer eye colour. Needless to say, worn on my eyes, it was quite impressive too! The powders in these eyeshadows are lovely and smooth and very fine so they go on your skin like butter. The color in Silver Look is on the cool side so it was quite flattering on my skin. 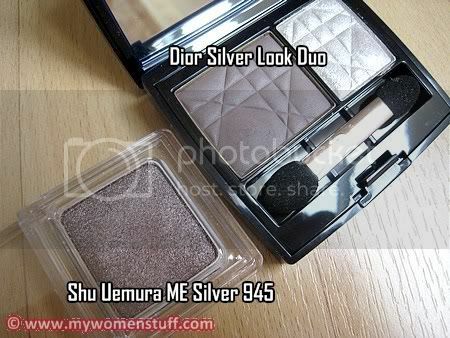 If you have the now discontinued Shu Uemura ME Silver 945, Silver Look is similar, but is its cooler toned cousin. I personally find Silver Look more flattering for me. In the box, Dior has recommended 3 different ways you can wear this new eyeshadow duo. They honestly look easier on paper than in reality, but you can create some different looks with this eyeshadow. The colour pigment is good for the matte brown side and the silver side has finely milled shimmer so it is not chunky glitter you get. I prefer to simply apply the matte brown all over my lid and then layer the silver over the brown with concentration of silver on the inner corners and on the brow bone. Then, I dab on extra brown on the outer corners and crease for definition. 5 minutes and I’m good to go – now why didn’t I do this before?! NEXT POST: Should I use Peach or Yellow Concealer for undereye? I used to think taupish-browns are better for me too but I am beginning to realise I’m better off with cool colours. Thanks for this review, I’m going to check out Dior Silver Look. I like the how it looks on your eyes. Hey!! I bought this on a whim as well on my previous trip back to Ipoh! I cannot remember why but I do know I had about RM200 burning in my pocket and dad was egging me on to use up my RM b/c there’s no point keeping it or changing it or etc and finally, I bought it to keep him quiet (I think he was antsy about me swiping colours non-stop at Dior). It’s one of the purchases I’ve fallen in love with over and over again each time I use it. Thanks for this review. It’s reminded me to pick this up and dust it a little and start using it. Like you, I swipe the brown over, then the silver over it and vamp it out with a little bit more brown on the outer corners. And, yes, I LOVE IT for work. I am one of those who passed by and doesn’t take a second glance for those silver and taupe shadows…but funny how I use them everyday for work! LOL thanks for the beautiful eye shot! really worth checking! That’s pretty. I love silver! I was never really a big fan of matte eyeshadows but they could be really nice together with the right finished eyeshadows. I haven’t found any taupe eyeshadows that will look good on me. silvery taupe doesn’t work for me as well as the brown taupe. i didn’t know this until very late stage into taupe. stupid of me. i realised shu 845 wasn’t for me but the new 850 is. i had tried this duo too and passed for that reason. i know how it works for you as you are cooler and lighter than me. the new Dior shadows now are really good in quality. it all comes down to which colours suit you and you want single, duo or quint. i wish they released singles that can be depotted liek MUFE, then i may be into them as their quints are getting too similar in some colours! i need variety! That looks absolutely fab for work, PB! I shall go check it out… soon. Hehehe. @Karen : Thanks, its a really nice colour because of the lack of red tones. @geekchic: You got this one too?! Yay! Its gorgeous on isn’t it? I love how easy it is to use and some days, easy is good. @Nikki: Thank you. Taupe is not an easy color to work with although it looks easy. The shades it comes in is quite mind boggling! @Amanda : I reckon this might make me braver to venture into matte shadows, but I still need my shimmer. Perhaps the Dior Silver Look might be your taupe? 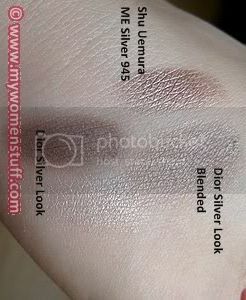 @Jojoba: I agree that Dior shadows tend to look all the same after a while. That’s why I went off the quints. @rinnah : Oh yeah! Its definitely doable for work which is wonderful for office ladies. @beetrice : But I thought you looked fine yesterday! Still, yes its a lovely eyeshadow duo – lucky I decided to take the plunge! The texture of the eye shadow appeals to me. @Ms. Blacklace : Its very pretty.